SYNOPSIS: Two shows on one disc. THE LAST POLKA: This 1hr mockumentary is a real gem. Despite the fatc it stars John Candy and Eugene Levy it's never been released on dvd! Along with "This is Spinal Tap" it's one of the first modern mockumentaries (ala Best in Show, Mighty Wind, etc). 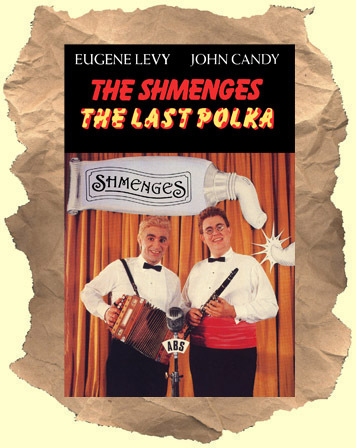 Taking it's cue from Martin Scorsese's The Last Waltz (which recorded the last concert of THE BAND) this comedy shows the last big bash of 'The Shmenges' - a forgotten polka duo. They've organized a concert with all their old friends including a hilarious Rick Moranis as 'Linsk Minyk', and a spoof of the 'The Lennon Sisters' called 'The Lemon Twins' (featuring Catherine O'Hara). Of course this is Candy and Levy's show and they are great! Everything from their clothes to their hairstyles to the warts on their faces is awful. Not to mention those great accents. Levy in particular looks so messed up and bizarre. The film shows the history of the Shmenges, their short lived TV show that mixed polka music and bowling: "Strikes, Spares and Shmenges", life in the suburbs today and of course lots of concert footage. If you've ever watched episodes of the old "Lawrence Welk show", a truly surreal funny experience in it's own right, then you'll appreciate how they captured the Polka world. A customer favorite and must have! 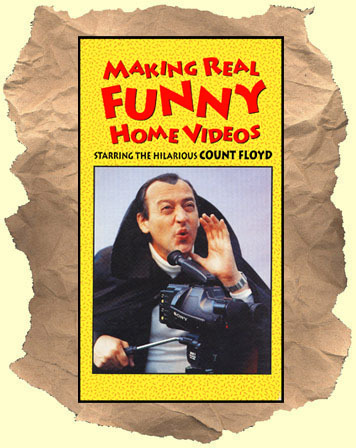 MAKING REAL FUNNY HOME VIDEOS: Back in the days when everybody was releasing stuff on vhs even SCTV's Count Floyd got in on the action. This 30min comedy tape has the, surprisingly suburban, horror host giving tips on filming and editing your very own "Real funny home videos, Ooooowww!" .